Recently when working with a client, I ran across an issue that I hadn’t seen before but we were able to quickly resolve it with PDFs and SharePoint Online. My client has over 1 million files that they were scanning to PDF to move to SharePoint Online in Office 365 as a digital records archive. Yes that’s right, over 1 million files. We did some initial testing of the scanning to upload process and quickly ran into an issue. If you clicked on the file from the library, it would try to open Word Online in a new browser tab, and would give the error message in the image above: “Hmm… looks like this file doesn’t have a preview we can show you”. 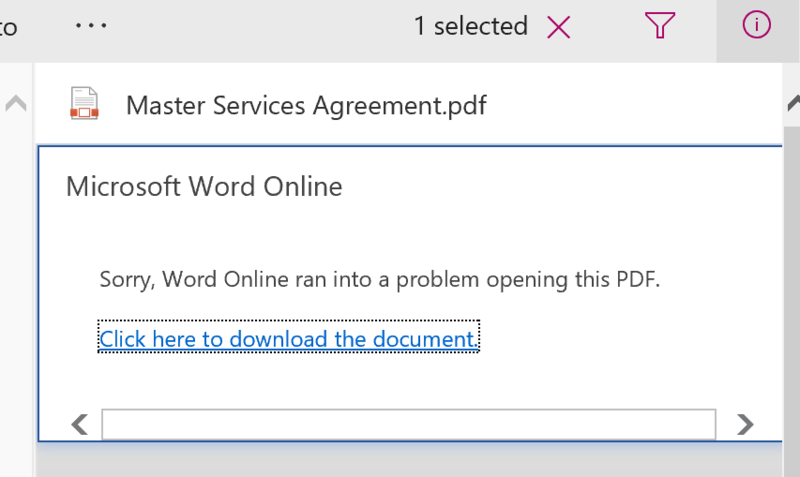 When you clicked the Details panel in the library, it fails to render a preview and gives the error “Sorry, Word Online ran into a problem opening this PDF”. This required users to save the PDF to open it. Clearly not an acceptable solution when we're trying to improve productivity. The client was using a Xerox high-capacity scanner / printer device to scan the documents to PDF. The default save type was just PDF. We changed the option PDF/A, and after uploading the file, it rendered fine! I love easy fixes. I've used other scanners and PDF worked fine, so I don't know exactly why the PDF/A worked magic on the Xerox scanner. But it’s an easy and quick test to see if this fixes it for you. Transforming to a digital workplace? Contact C5 Insight for the business expertise and technology genius that you need! We're here to help.